This week was it. The moment that manga fans have been waiting to see animated for years upon years. Its an odd feeling, seeing something that I honestly never thought I’d see in the anime medium, and then just kind of react to it in a very… Lukewarm way. 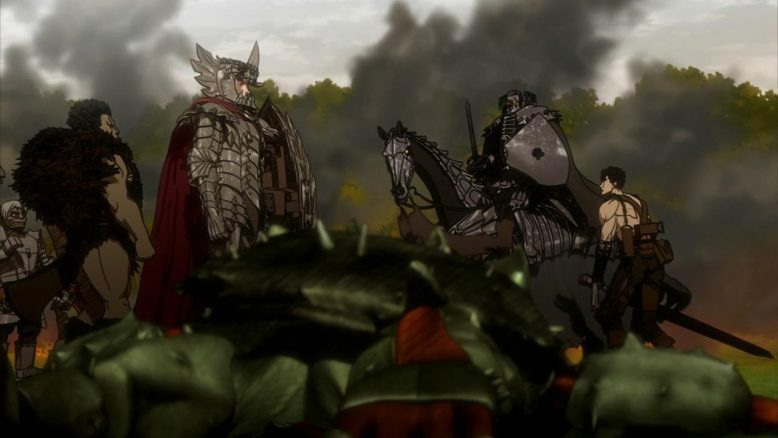 Berserk is a story that takes many forms, and even crosses genre from Medieval alternate history to dark gritty monster fantasy, to full on traditional fantasy, but its at this point, that the dark themes from the earlier part of the series meld completely with the more fantasy based approach that the franchise has settled on more recently. 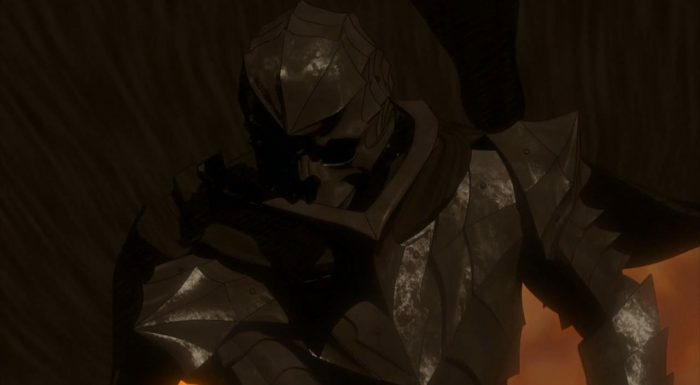 The black armor (which will have it’s proper name revealed soon I imagine), is one of the coolest things that Berserk ever threw at its readers, and now viewers. Here’s the thing, Guts has been pretty much managing on his own, human against a million bizarre monsters and otherworldly beings, and he’s always been at a disadvantage. He’s been the under dog, the under equipped, and thus every monster he’s taken down, every apostle or even godhand that he’s faced, has been a fairly unbelievable feat as a result. Its also worth noting that while Guts has been extraordinary in how he’s taken on and won against every seemingly impossible situation that’s been thrown at him, he is still, at the end of the day human. Nowhere is that shown more prominently than in this week’s episode, as Guts and his comrades return to Schierke’s mistress, only to see her home being attacked by apostles. Now, its enough of a problem that nearly everyone in the group is exhausted and broken from the previous battles they’ve had, but the most broken has got to be Guts himself. The wound that Slan inflicted on Guts isn’t something he can just shrug off, its something that’s injured him on a celestial/spirtual level even more so than a physical one. And here’s the thing, I really dig this about Berserk, and how it pretty much renders Guts powerless in the battles he has to partake in, this week. It makes total and complete sense that Guts, as impressive as he is, would have some serious damage after taking on a godhand and barely scraping a win. It also leads to a pretty decent sense of tension, because its not all that clear that Guts is actually going to be able to protect everyone around him. 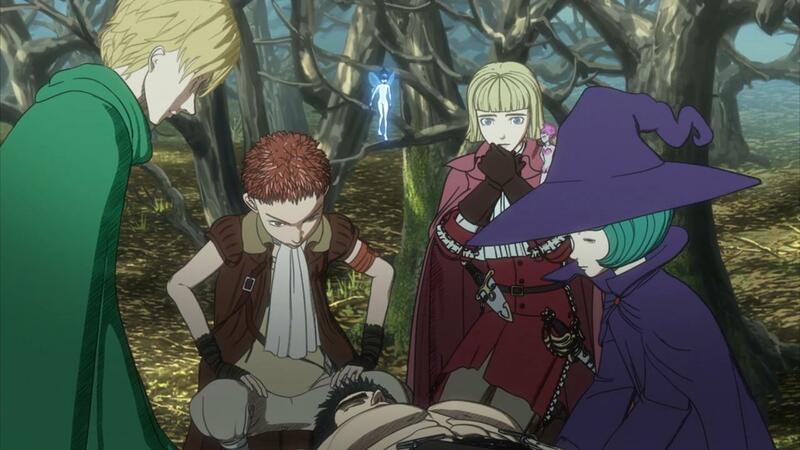 Things have been going a bit too well for our protagonist as of late, and if you’re someone who’s followed Berserk for a while, you’ll recall that the tables quickly turn for the worst whenever that happens. And things do turn pretty bad this week, as not one, but two of the “new” Band of the Hawk members are sent by Griffith to take down the “Witch in the forest”. Having two insanely monsterous beings to take on, renders even the benefit of having The Skull Knight around pretty darn moot. 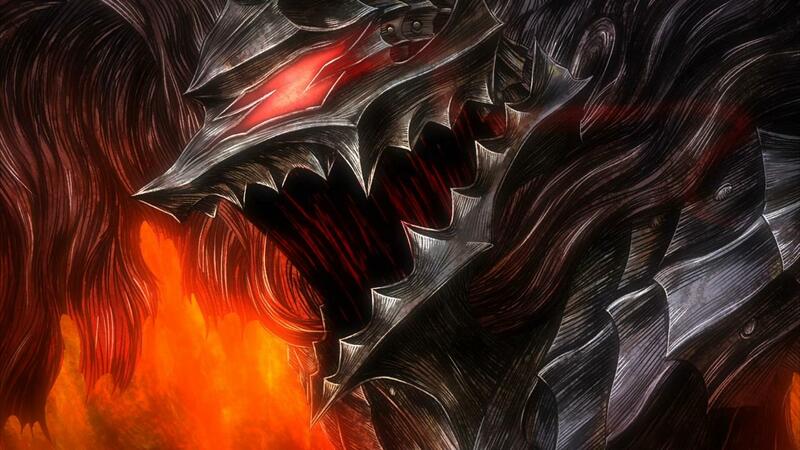 While the Skull Knight takes on none other than Zodd, Guts is left to deal with the other monster, Grunbeld. We’ve only briefly seen Grunbeld at this point, but it’s clear that he’s a foe that’s at least on Grodd’s level, if not stronger. The problem, of course, is that even at his best, Guts could only match Zodd, not take him down. Things are considerably dire this time around, however, and Guts loses pretty badly due to how bad his injuries from his last battle are. 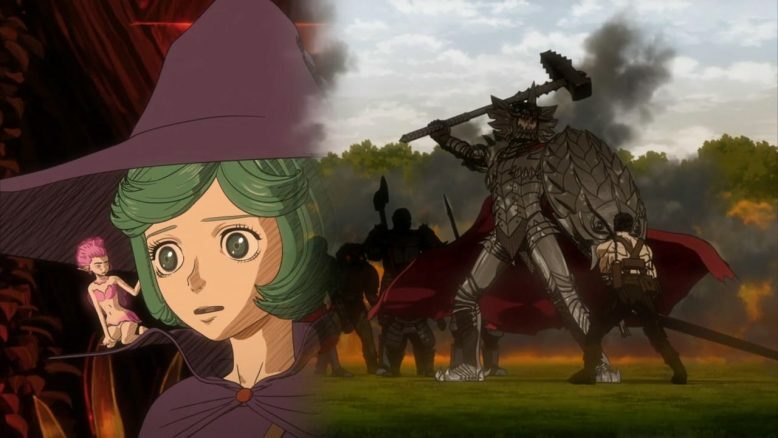 Which of course, leads to Schierke bringing Guts the Black Armor and having him don it, to even the odds. Of course, as Schierke kind of hints at, while the Armor is definitely going to help, its not exactly as simple as just using it as a tool to gain power. Like nearly everything that Guts seems to get tossed his way, there’s a price or a catch to whatever aid he does get, and it’ll be the next episode where we find out about what exactly the armor is, and what it actually does. As for the reveal, and the transformation of the armor from its previous form, to the one that it now has with Guts in it? I thought it was decently done. What’s most unfortunate about seeing this moment animated, even after all these years, is that the current production values that this Berserk series has, just can’t do the moment justice. The show does the best it can, in its meagre means, but for once, the anime has been unable to capture that feeling of epic awesome that the manga showed off with its superb art on its physical page. There were some other problems with the reveal too. In the manga, there was a sense of build up, a feeling of everything really turning bad before Guts was given the armor. Here in this week’s episode, however, the pacing was all over the place, and the episode itself kind of killed its own surprise by showing the armor in its very first scene. The pacing itself was a bit off too, and the moment that the episode ended on felt like a very odd moment to stop at. 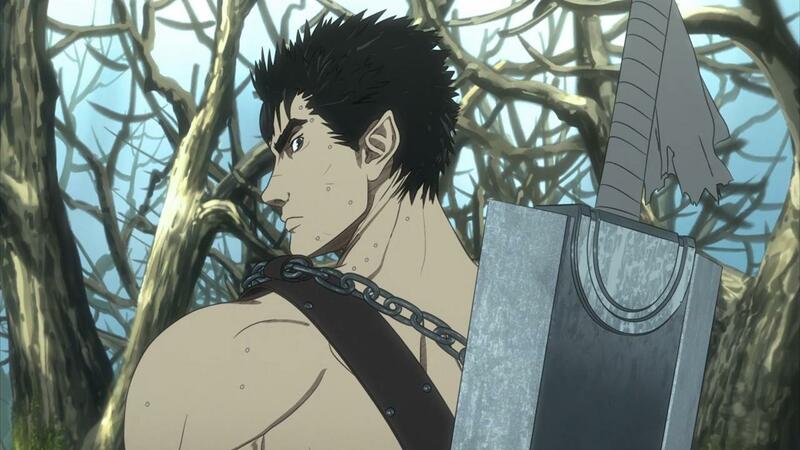 Everyone around Guts was gasping at the Armor changing shape, but then the episode just ends as the transformation completes. There’s no payoff to actually seeing the armor itself on Guts, and we’re left waiting an entire week for the actual result of whatever it is that Guts and Schierke did this week. This is one place where the anime really could’ve killed it. 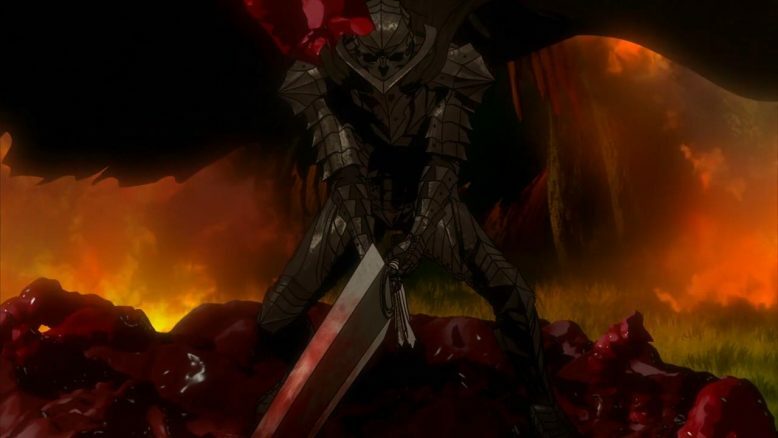 The show really could’ve built up to the armor, and then positioned it so that we saw Guts use it the same week it was revealed. Instead of that, we got a sort of haphzard rush to the moment where Guts emerged in the Armor, and ended JUST as things got exciting. Excitement, I think, was the one thing I really wanted to feel this week, and I did, although not because of the show itself. My excitement actually stemmed from my knowledge of what was coming, and just as my knowledge of the manga helped build a sense of anticipation, so too did it create a sense of disappointment too. This wasn’t a bad episode per say, but if there were ever an episode where the missed potential and opportunity of a well animated and top tier Berserk animated series was evident, it was the one we got this week.